Michael Nelson Trout (born August 7, 1991), nicknamed The Millville Meteor, is an American professional baseball center fielder for the Los Angeles Angels of Anaheim of Major League Baseball (MLB). Trout was the American League (AL) Most Valuable Player (MVP) in 2014 and 2016 (finished second in 2012, 2013 and 2015), is a five-time All-Star, and a two-time All-Star Game MVP since becoming a regular player in 2012. Trout was a first-round pick by the Angels in the 2009 MLB draft and made a brief major league appearance in 2011 as a teenager. He became a regular player for the Angels the subsequent season and won the 2012 AL Rookie of the Year Award unanimously. He is under contract with the Angels through 2020. Trout's MLB performances have received praise from both the mainstream media and sabermetricians, and he is regarded as one of the most outstanding young players in the history of baseball, as well as one of the best current players in all of MLB. Trout has led the major leagues in wins above replacement (WAR) in four of his five full seasons (according to Fangraphs and Baseball-Reference.com). Born in Vineland, New Jersey, to Jeff and Debbie Trout, he has two older siblings, sister Teal and brother Tyler. His father, Jeff (born January 7, 1961), played baseball at the University of Delaware  and was a fifth-round draft pick as a second baseman by the Minnesota Twins in 1983. Jeff played four years of minor league baseball before a torn plantar fascia and knee injuries ended his career. Trout began playing baseball in Little League. His main position as a little leaguer was the shortstop position. He wore #2 in honor of his childhood hero, New York Yankees shortstop Derek Jeter. He would switch to #1 in high school. Mike attended Lakeside Middle School and is a 2009 graduate of Millville Senior High School. Trout attended Millville Senior High School in Millville, New Jersey where he played both baseball and basketball, earning five letters (three in baseball and two in basketball). In his junior year, he threw a no-hitter against Egg Harbor Township High School. The Thunderbolts made it to the state playoffs and were defeated by Cherry Hill High School East. He started as a pitcher and shortstop, and was shifted to the outfield during his senior year. That year, he hit 18 home runs, a New Jersey high school record. Trout had committed to play baseball at East Carolina University prior to the 2009 MLB Draft. Millville initially planned to retire Trout's jersey number, but instead began awarding it to the team captain, starting in 2012. Trout played travel ball with Tri-State Arsenal, one of the premier travel programs in the Northeast. He began working with the coaches at Arsenal at age 14. Trout played in various tournaments with Tri-State Arsenal, including the Perfect Game WWBA Championships in Jupiter, Florida in 2007 and 2008. In the summer before his senior year, Trout attended the Area Code Games in southern California, where he went 6-for-11 against some of the best players in the country. Angels scout Greg Morhardt, who had played in the minor leagues with Trout's father, claimed Mike was the fastest and strongest 17-year-old he had ever seen. Trout was drafted by the Angels, using their compensation pick from the New York Yankees for their signing of Mark Teixeira, 25th overall in the 2009 MLB draft. He started his professional career in 2009 playing for the Arizona Angels of the rookie-level Arizona League, hitting .360 with a .418 OBP and .506 SLG with one home run, 25 runs batted in (RBIs), and 13 stolen bases in 187 plate appearances over 39 games. He was beaten out in being named AZL Most Valuable Player by Cody Decker. He finished the season playing for the Cedar Rapids Kernels of the Class A Midwest League, hitting .267 over 20 plate appearances in five games. Before the 2010 season, Trout was considered the Angels' third-best prospect and the 85th-best in all of baseball by Baseball America. He started the season playing for Cedar Rapids, where he hit .362 with a .454 on-base percentage (OBP) and a .526 slugging percentage (SLG) with six home runs, 39 RBIs, and 45 stolen bases in 82 games. He was selected to play in the All-Star Futures Game. In July, Baseball America named Trout the second-best overall baseball prospect. After the Futures game, he was promoted to the Rancho Cucamonga Quakes of the Class A-Advanced California League. After the 2010 season, Trout was named 2010 J.G. Taylor Spink Award as the Topps Minor League Player of the Year. At just 19 years and two months, he was the youngest player to win this award. He was also named a Baseball America All-Star as well as a Topps Class A All-Star. Prior to the 2011 season, Trout was ranked number one by ESPN's Keith Law in his 2011 top 100 prospects list and by MLB's Jonathan Mayo. Trout started the 2011 season with the Arkansas Travelers of the Class AA Texas League. He hit .324 with nine home runs, 27 RBIs and 28 stolen bases in his first 75 games. 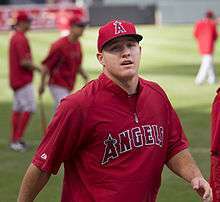 The Los Angeles Angels of Anaheim promoted Trout on July 8, 2011, to replace the injured Peter Bourjos in center field. He made his major league debut that night, going 0-for-3. In his next game, Trout recorded his first career major league hit, an infield single against Seattle Mariners pitcher Michael Pineda in the bottom of the third inning. He hit his first major league home run against Baltimore Orioles pitcher Mark Worrell on July 24. Trout was sent back to Double-A Arkansas on August 1, 2011 after hitting .163 with one home run and six runs batted in 12 starts for the Angels. After spending time back in Double-A Arkansas, Trout was recalled by the Angels on August 19, 2011. That night, he went 1-for-4 with a home run, his first at Angel Stadium. On August 30, Trout became the youngest Angel to hit two home runs in one game, homering off of Mariners pitcher Anthony Vazquez in the top of the second inning and again in the top of the fourth inning. In his 40-game rookie big league stint in 2011, Trout's batting average was .220, while his on-base percentage was .281 and his slugging percentage .390. For the 2011 season, of the 13 votes cast for the USA Today Minor League Player of the Year Award, Trout received the 2 votes allocated to the fan poll. He was named Baseball America Minor League Player of the Year after hitting .326/.414/.544 with 11 home runs, 38 RBIs, 82 runs scored and 33 stolen bases in 91 games. He was again named an outfielder on Baseball America's 2011 Minor League All Star team. Trout began the 2012 season with the Salt Lake Bees of the Triple-A Pacific Coast League. On April 28, he was again brought up from the minors, this time to replace Bobby Abreu (who was batting .208 in 24 at-bats). At that time, Trout had a .403 batting average, a .467 on-base percentage, and a .623 slugging percentage in 20 games with Salt Lake. Trout recorded his first career four-hit game on June 4, and 15 days later Trout had his second career four-hit game. In the process, he scored all four times and two of his four hits went for doubles. Trout, along with Angels right fielder Torii Hunter, was named American League co-Player of the Week from June 4–10. During that stretch, Trout went 13-for-25 for a .520 batting average to go along with 10 runs scored and four stolen bases. On June 27 against the Baltimore Orioles, Trout had his third career 4-hit game in the same month. In the same game, he showed off his defensive skills when he robbed Orioles shortstop J. J. Hardy of a home run as he leaped up in the center field wall to make a spectacular catch in the bottom of the first inning. Trout broke both an Angels' franchise and American League rookie record when he crossed home plate in 14 consecutive games after scoring a run in a game on July 22. Trout's 26 stolen bases tied Jerry Remy for the team's rookie record for most stolen bases by the All-Star Break. Playing in his first All-Star Game, Trout singled off of New York Mets pitcher R.A. Dickey in the bottom of the 6th inning and drew a base on balls against Cincinnati Reds pitcher Aroldis Chapman in the bottom of the 7th. In the month of June, Trout batted .372 with three home runs and 16 RBI and was named AL Player of the Month and AL Rookie of the Month. Angels manager Mike Scioscia explained Trout's impact by saying, "It's a pleasant surprise only with the fact that you see very few guys come up and do this much. Is it surprising that Mike Trout's talent is able to produce what's happening on the field? No, that's not a surprise. He's an extraordinary talent." Trout's 34 runs scored in July tied the Major League rookie record with Cleveland Indians first baseman Hal Trosky in 1934. He had a .392 batting average, 10 home runs, and 23 runs batted in. In addition, Trout continued to show his speed by stealing nine bases and scoring 32 runs in July. Trout also became the first rookie to drive in at least 55 runs and score 80 runs in 81 games since Joe DiMaggio in 1936." Against the White Sox on August 4, Trout made another highlight catch, robbing second baseman Gordon Beckham of a home run in the second inning. White Sox catcher A. J. Pierzynski told reporters after the game that Trout "makes those catches in the outfield look so good.". On August 21, Trout went 2-for-4 in a victory over the Red Sox, raising his batting average to .344. With the .344 average, Trout set the rookie record for batting average through 100 games. Trout finished the month of August with a .284 batting average, seven home runs, 19 runs batted in, 11 stolen bases, and an .866 OPS. Trout was again named AL Rookie of the Month for August, his fourth time winning the honor. In winning the award for the fourth time, Trout became the first American League rookie since Ichiro Suzuki in 2001 to win Rookie of the Month four times during a single season. Trout became the youngest player ever to hit at least 20 home runs and steal at least 40 bases in a season. Houston Astros center fielder César Cedeño had been the youngest player to accomplish the feat, doing so in 1972. He also became the youngest hitter ever to hit at least 20 home runs and steal at least 30 bases in a season. Trout scored his 100th run of the season on August 26, becoming the second Angels rookie to score at least 100 runs in a season after Devon White. Trout set a new Angels record for runs scored in a rookie season, passing White. Trout scored three runs that day, the tenth time in the 2012 season where he scored three or more runs in one game, the most since Sammy Sosa's 11 games in 2001. On September 9, in a game against the Detroit Tigers, Trout became the first player in baseball history under the age of 22 to hit a leadoff home run in back-to-back games. On September 21, Trout became the first rookie to score 120 or more runs since Ichiro Suzuki and the fourth rookie to accomplish that feat since 1964. On September 30, Trout became the youngest player in Major League Baseball history to join the 30–30 club when he belted a 7th-inning home run off of Texas Rangers pitcher Yu Darvish, helping the Angels win the game by a score of 5–4. Trout became the first player in MLB history to hit 30 home runs, steal 45 bases and score 125 runs in one season. Trout set the Angels' club record for most runs scored in a season, surpassing Vladimir Guerrero. He also set the Angels rookie record for most hits in a season with 173, passing Wally Joyner. Trout became the first rookie ever to hit 30 home runs and steal 40 bases in the same season. In addition, Trout finished second in the AL in batting average (.326), third in slugging percentage (.564), third in on-base percentage (.399), second in OPS (.963), 9th in hits (182), and first in OPS+ (171). He became the first Angels player to lead the league in stolen bases since Chone Figgins did so in 2005 with 49 stolen bases. According to Baseball-Reference.com, Trout finished with a wins above replacement (WAR) value of 10.9, 2.4 better than second-place finisher Robinson Canó of the Yankees. Trout was the first position player to have a WAR above 10.0 since Barry Bonds for the San Francisco Giants in 2004. Trout led the Angels in batting average, runs scored, hits (182), triples, stolen bases, total bases (315), base on balls, batting average, on-base percentage, slugging percentage, and on-base plus slugging despite playing in just 139 games. He was tied with Pujols for second place on the team in home runs behind Mark Trumbo and was fourth in runs batted in. On November 12, 2012 Trout won the BBWAA Jackie Robinson Rookie of the Year Award, receiving 28 of 28 first place votes, becoming the first Angels player to win the award since Tim Salmon won it in 1993 and the youngest player to win the AL Rookie of the Year Award. Trout became just the 18th Rookie of the Year winner to win the award unanimously. On November 13, Trout won the Heart and Hustle Award, given to the player who "demonstrates a passion for the game of baseball and best embodies the values, spirit and traditions of the game." Trout was one of three outfielders in the American League to win the Silver Slugger for being the best offensive players at their position; the others were then-Ranger Josh Hamilton and Josh Willingham of the Minnesota Twins. He also won a Fielding Bible Award as the best fielding center fielder in MLB. Trout's high WAR value led many to support his candidacy for American League Most Valuable Player. Trout's main competition for the award was Miguel Cabrera, who became the first player since Carl Yastrzemski in 1967 to win the triple crown by leading the AL in batting average, home runs, and runs batted in. The race between Trout and Cabrera created controversy amongst baseball fans and writers, and was described by many as a clash between new-age sabermetrics and supporters of more "traditional" statistics. In supporting Trout's case, Jayson Stark wrote, "We just understand that Trout's insane 10.5 WAR are one more clear indication that he's a better baseball player than even one of the greatest hitters of our lifetimes. ... If you want to toss in his slash line, his 62 extra-base hits, his 92.3 percent stolen-base success rate or any other item on his stat sheet, you'll find that no player in the history of baseball has combined this much excellence in so many areas in the same season." Meanwhile, Scott Miller of CBS Sports wrote, "Nobody combined overall statistics, badass lineup presence and value to his team more than Triple Crown winner Miguel Cabrera." On November 15, Cabrera won the MVP decisively, winning twenty-two of twenty-eight first place votes to Trout's six. Trout began the 2013 season as a left fielder, in order to accommodate for Peter Bourjos in center field. Trout started the 2013 season slowly, hitting .261 with 2 home runs and 16 RBIs in April. During a game on April 20 against the Detroit Tigers, Trout hit his first career grand slam off pitcher Rick Porcello, capping a 10-run inning for the Angels, their highest-scoring inning in almost 18 years. On April 30, Bourjos injured his hamstring, and Trout was moved back to center field. In May, Trout regained his rookie-year form, batting .327 with 8 home runs, 21 RBIs, and 27 runs scored. Trout stated that he had struggled early in the season because he was chasing pitches out of the strike zone and pressing too much on himself. On May 21, 2013 Trout became the youngest player to hit for the cycle in American League history and sixth youngest in Major League history, doing so at home against the Seattle Mariners. On May 30, Angels manager Mike Scioscia announced that Trout would return to left field after Bourjos returned from the disabled list. This decision caused some controversy, as some believed that Trout's successful May was a direct result of his move back to center field. Scioscia, however, believed that Trout's numbers as a center fielder had to do with his batting-order position and hype subsiding. On June 8, with shortstop Erick Aybar struggling at the leadoff spot, Trout began batting leadoff, marking his first time hitting in the leadoff spot since April 14. In his first game batting leadoff since mid-April, Trout went 3 for 5, with two doubles, a run batted in, scored two runs, had a base on balls, and stole a base, helping the Angels win the game over the Boston Red Sox in the first game of a double-header. Trout indeed moved back to left field after Bourjos returned to the Angels' lineup on June 10. In his 249th career game, he scored his 200th career run, becoming the fastest player to accomplish this since Ted Williams (225 games) and Barney McCosky (236 games) did it in 1940. Trout represented the Angels in the 2013 Major League Baseball All-Star Game. He was the leading vote-getter among all AL outfielders and the first Angels position player to start in the All-Star Game since Vladimir Guerrero in 2007. In the month of July, Trout led all of baseball with an on-base percentage of .475 and OPS of 1.108. In addition, he was the only player in the American League to reach base in every game of the month and became the first Angels player to have two consecutive streaks of reaching base in at least 33 games. Trout continued his strong play in August, batting .337 with 6 home runs and an on-base percentage of .500. As in 2012, Trout's play declined somewhat in September, as he batted .281 with 4 home runs and 4 stolen bases. According to Baseball-Reference, Trout finished the 2013 season with 9.2 WAR, again the highest in baseball. Notably, Trout's walk rate increased from 10.5% in 2012 to 15.4% in 2013. Trout's 110 bases on balls led the American League. Echoing the 2012 season, Miguel Cabrera won the 2013 AL MVP with twenty-three first-place votes, while Trout finished second with five. Rumors of a contract extension surfaced in February 2014, as news outlets reported that the Angels were considering offering Trout a six-year $150 million contract. Instead, he signed a one-year, $1 million contract. That figure is the highest ever for a player not yet eligible for salary arbitration. On March 28, 2014, the Angels announced they had signed Trout to a 6-year, $144.5 million extension. On April 19, 2014 Trout went 0-4 with four consecutive strikeouts against Max Scherzer, giving him his first golden sombrero after playing in 353 games. On May 15, Trout hit his first career walk-off home run in a 6-5 victory over the Tampa Bay Rays. On July 15, Trout appeared in his third All-Star Game at Target Field in Minnesota. He went 2 for 3, with a double, a triple, and two RBIs. He was named the Most Valuable Player of the game, making him the second-youngest All-Star Game MVP behind Ken Griffey Jr. in 1992. On June 27, Trout hit the longest home run of the 2014 season, according to ESPN.com's Home Run Tracker. The ball was hit 489 feet into left-center field at Kaufmann Stadium, Kansas City, Missouri. Playing in 157 games in 2014, Trout batted .287 with 36 home runs, 39 doubles, nine triples, an AL-leading 111 RBIs, 16 stolen bases and an MLB-leading 115 runs scored. He also struck out a league-high 184 times. In an interview with Ken Rosenthal, Trout attributed his increased strikeouts to a "golf-swing." Nevertheless, Trout added he is working with staff to fix correct the strikeout tendency, and what may have been the only significant flaw of his all-around game. In Game 3 of the 2014 American League Division Series against the Kansas City Royals, Trout hit his first career postseason home run but later in the ninth inning, he was the final batter of the Angels to strike out as the team lost to the Royals in a three-game sweep of the series. On November 13, 2014, Major League Baseball announced that Trout was unanimously selected as the AL MVP, becoming the sixth player in MLB history to win both the regular season MVP and the All-Star Game MVP in the same season. Further, at the time, he was the fifth-youngest MVP ever, the 17th to win unanimously, and the fifth in Angels' franchise history, following Vladimir Guerrero in 2004. On April 17, 2015, Trout became the youngest player in MLB history to reach 100 home runs and 100 stolen bases. He was 23 years and 253 days old when he reached the milestone, passing the previous record-holder, Alex Rodriguez, who had achieved it at the age of 23 years and 309 days in 1999. Trout led off the 2015 MLB All-Star Game with a home run, becoming the fourth player in All-Star Game history to do so. For the second year in a row, Trout won the All-Star Game MVP Award, becoming the first player ever to win it in consecutive years. On September 22, Trout hit his 40th home run, becoming only the second Angels player to hit 40 home runs in a season. Trout led the AL in WAR for the fourth straight year. Trout finished the season with 41 homers and 90 RBIs. He also led all American League players in slugging percentage, and OPS with a slashline of .299/.402/.590/.991. For his offensive performance, Trout would go on to win his fourth Silver Slugger Award in as many seasons. In doing so, he became only the second player since Mike Piazza to win four straight Silver Slugger Awards to start off a career. He also won the Best Major League Baseball Player ESPY Award. On November 10, it was announced that Trout, along with Royals outfielder Lorenzo Cain and Blue Jays third baseman Josh Donaldson, were finalists for the AL MVP. Trout became the first player since Barry Bonds to be among the top three in MVP voting in four straight seasons. On November 19, Trout finished second to MVP winner Josh Donaldson, making it the third time he would finish second in MVP voting in his four big league seasons. In June 2016, Sporting News named Trout "baseball's best player" for the season. According to Fangraphs, he had accumulated more WAR through his age-24 season (on August 12, 2016) than any other player since 1913, with 45. Mickey Mantle was second with 41.1, followed by Mel Ott, Jimmie Foxx, and Ted Williams. A close contemporary of Trout's, Alex Rodriguez, was seventh. In 159 games of 2016, Trout led the MLB with walks (116), runs scored (123), and on-base percentage (.441). He also had a .315 batting average, 29 home runs, 30 stolen bases, and 100 RBI. On November 17, Trout was announced as the 2016 AL MVP, winning the award for the second time in his career. Trout also joined Barry Bonds as the only other player to finish top 2 for the MVP in five straight seasons. He was the 2016 Esurance MLB/This Year in Baseball Award winner for Best Major Leaguer. Trout's combination of power and speed has drawn comparisons to Hall of Fame center fielder Mickey Mantle. Trout has hit at least 27 home runs and 35 other extra base hits per season between 2012 and 2015, while also maintaining a high batting average and walk rate. He is particularly able to hit pitches that are low in the strike zone. Trout's speed has allowed him to be an above average defender in center field (according to ultimate zone rating) and he is also a proficient baserunner, stealing 113 bases between 2012 and 2015 at a success rate of 84 percent. In the four-year period since Trout became a regular player, he has been MLB's most productive batter, according to Fangraphs. Trout led all MLB players in total runs above average (park-adjusted wRAA) with 221.5 runs, and led all qualified players in productivity per plate appearance (wRC+), producing runs at a rate 71 percent above league average. Trout's exceptional performance at his young age has caused him to be compared to Ted Williams. Trout's nicknames include "Prince Fish", "God's Gift" and "King Fish 2.0", in reference to retired Angel Tim Salmon. He adopted the nickname "Millville Meteor" after a prankster edited his Wikipedia article and the name caught on. In February 2014, President Barack Obama used Trout as an analogy for the 2014 U.S. Farm Bill. To emphasize the versatility and utility of the bill, Obama remarked that it was "like Mike Trout, for those of you who know baseball...somebody who's got a lot of tools." "Who is Mike Trout?" was an answer on a February 2013 episode of the quiz show Jeopardy! during the show's teen tournament. Trout has been a partner and investor in Bodyarmor SuperDrink, a sports drink, since 2012. He has sponsorship agreements with Subway and SuperPretzel and in 2014, Nike began selling Mike Trout branded shoes. ↑ Jazayerli, Rany (September 24, 2013). "Mike Trout's Opening Act". Grantland.com. Retrieved January 20, 2015. ↑ Verducci, Tom (September 20, 2013). "Mike Trout is the game's best young player since Ted Williams". SI.com. Retrieved January 20, 2014. ↑ Paine, Neil (April 22, 2014). "Mike Trout And Bryce Harper Are Baseball's Best Young Position-Player Duo Ever". fivethirtyeight.com. Retrieved January 20, 2014. ↑ Berg, Ted (August 7, 2014). "Happy birthday to Mike Trout, the best young player in Major League history". usatoday.com. Retrieved January 20, 2014. ↑ "Jeff Trout Minor League Statistics & History". Baseball-Reference.com. Retrieved April 6, 2015. 1 2 3 "Baseball Announces 2009-10 Recruiting Class". ecupirates.com. Retrieved April 6, 2015. 1 2 Rosenthal, Ken (May 13, 2012). "How Los Angeles Angels hooked Mike Trout in MLB Draft". Foxsports.com. Retrieved May 14, 2012. 1 2 "Mike Trout — Biography". JockBio. Retrieved May 17, 2013. ↑ "In Mike Trout's hometown of Millville, he's just a regular guy". NJ.com. Retrieved April 6, 2015. ↑ "Millville's Trout just as intense on basketball court". NJ.com. Retrieved April 6, 2015. ↑ "Mike Trout is New Jersey's finest baseball player". NJ.com. Retrieved July 26, 2012. 1 2 3 Shelburne, Ramona (July 11, 2010). "Angels' Trout a diamond in the rough". ESPN.com. Retrieved September 7, 2011. ↑ Gonzalez, Alden (June 10, 2015). "Brother of Trout's girlfriend drafted by Angels". MLB.com. Retrieved June 14, 2015. ↑ "Bradley: The Legend of Mike Trout continues to grow". NJ.com. Retrieved April 6, 2015. ↑ "Mike Trout Baseball Profile – Perfect Game USA". perfectgame.org. Retrieved April 6, 2015. ↑ "Area Code Games Wrap-up". MaxPreps.com. Retrieved April 6, 2015. ↑ Rich Schultz (June 9, 2009). "Millville's Mike Trout picked 25th overall by Los Angeles Angels of Anaheim in the major league baseball draft". NJ.com. Associated Press. Retrieved September 7, 2011. ↑ Eddy, Matt (January 18, 2010). "Angels Top 10 Prospects". Baseball America. Retrieved September 7, 2011. ↑ "Baseball America Top 100 Prospects". Baseball America. February 23, 2010. Retrieved September 7, 2011. ↑ "Midseason Updated Top 25 Prospects". Baseball America. July 9, 2010. Retrieved September 7, 2011. ↑ DiGiovanna, Mike (July 13, 2010). "Angels promote top prospect Mike Trout to Rancho Cucamonga". Los Angeles Times. Retrieved September 7, 2011. 1 2 "Trout named 2010 Spink Award winner". MiLB.com. October 27, 2010. Retrieved September 7, 2011. 1 2 3 "Mike Trout Stats, Bio, Photos, Highlights". Minorleaguebaseball.com. Retrieved September 7, 2011. ↑ "Keith Law: Top 100 prospects of 2011 (Nos. 1–25)". ESPN.com. February 1, 2011. Retrieved September 7, 2011. ↑ "Breaking down MLB.com's 2011 Top 50 Prospects list". MLB.com. January 25, 2011. Retrieved September 7, 2011. 1 2 Garretson, Jordan (July 8, 2011). "Trout makes highly anticipated Majors debut". MLB.com. Retrieved July 9, 2011. ↑ "Torii Hunter homers twice as Angels blow away Michael Pineda, M's". ESPN.com. Associated Press. June 3, 2013. Retrieved June 3, 2013. ↑ "Mike Trout's first big league homer helps Angels pull away from Orioles". ESPN.com. Associated Press. July 24, 2011. Retrieved September 7, 2011. ↑ "Angels OF Mike Trout headed back to minor leagues". Los Angeles Times. Retrieved July 26, 2012. ↑ "Torri Hunter's 2 HRs help Dan Haren, Angels handle O's". ESPN.com. Associated Press. August 19, 2011. Retrieved September 7, 2011. ↑ "Mike Trout's 2 homers lead Angels' rout of Mariners". ESPN.com. Associated Press. June 3, 2013. Retrieved June 3, 2013. ↑ Baxter, Kevin (August 31, 2011). "Mike Trout powers Angels past Mariners, 13–6". Los Angeles Times. Retrieved May 14, 2012. ↑ "Mike Trout Stats – Los Angeles Angels". ESPN.com. Retrieved November 21, 2013. 1 2 "Fans like Trout as top minor leaguer". USA Today. August 31 – September 6, 2011. p. 24. Mike Trout won the fan poll with 46% of the 3,271 votes cast at USATODAY.com. 1 2 Baxter, Kevin (September 7, 2011). "Angels FYI: Mike Trout is Minor League Player of the Year". Los Angeles Times. Retrieved September 7, 2011. ↑ Cooper, J.J. (September 7, 2011). "2011 Minor League Player Of The Year Mike Trout". Baseball America. Retrieved November 8, 2011. 1 2 Cooper, J.J.; Eddy, Matt (September 16, 2011). "2011 Minor League All-Star Team". Baseball America. Retrieved October 2, 2011. ↑ "Mike Trout Minor League Statistics & History". www.baseball-reference.com. baseball-reference.com. March 28, 2014. Retrieved March 28, 2014. 1 2 "Albert Pujols, Mike Trout help Angels rally past Dodgers". ESPN.com. June 11, 2012. Retrieved June 15, 2012. ↑ "Angels cap two-game sweep of Orioles with 13–1 dismantling". ESPN.com. Associated Press. June 27, 2012. Retrieved August 4, 2012. ↑ Gonzalez, Alden (July 23, 2012). "Haren, Angels take rubber match from Rangers". MLB.com. Retrieved July 24, 2012. ↑ "Mike Trout — Facts". JockBio. Retrieved May 17, 2013. ↑ "Jul 10, 2012, NL All-Stars at AL All-Stars Box Score and Play by Play". Baseball Reference. Retrieved May 17, 2013. ↑ "Twice as good: Trout again AL Rookie of Month". MLB.Com. July 2, 2012. Retrieved May 17, 2013. ↑ "Mike Trout 2012 Baseball Splits". Baseball Reference. Associated Press. May 17, 2013. Retrieved May 17, 2013. 1 2 Peter Woodburn (May 17, 2013). "Angels' Mike Trout In Elite Company In Rookie Season". SBNation.com. Retrieved May 17, 2013. ↑ "Albert Pujols homers again as Angels edge White Sox in 10". ESPN.com. Associated Press. May 28, 2013. Retrieved May 18, 2013. ↑ "Mike Trout 2012 Batting Gamelogs". Baseball-Reference.com. Associated Press. June 3, 2013. Retrieved June 3, 2013. 1 2 Riley Breckenridge (September 9, 2012). "Angels Mike Trout Wins AL Rookie Of The Month, Again". SBNation.com. Associated Press. Retrieved September 10, 2012. ↑ Aaron Gleeman (September 9, 2012). "Ho hum: Mike Trout did another record-breaking thing/". NBCSports.com. Associated Press. Retrieved September 10, 2012. ↑ "Bartolo Colon takes shutout into seventh as A's batter Angels". ESPN.com. Associated Press. August 7, 2012. Retrieved August 17, 2012. ↑ "Bats go silent as Angels drop finale in Detroit". MLB.com. October 2, 2012. Retrieved May 18, 2013. ↑ "Kendrys Morales' 4 RBIs pace Angels' rout of Mariners". ESPN.com. Associated Press. August 31, 2012. Retrieved August 31, 2012. ↑ "Zack Greinke guides Angels to sixth straight win". ESPN.com. Associated Press. September 9, 2012. Retrieved September 10, 2012. ↑ "Santana's dominant game is Angels' gain". MLB.com. October 2, 2012. Retrieved May 18, 2013. ↑ "Hunter stuns Rangers in ninth inning of Game 1". MLB.com. September 30, 2012. Retrieved May 18, 2013. ↑ Stark, Jayson (October 2, 2012). "Mike Trout, Buster Posey, and the rest of the 2012 award winners". ESPN. Retrieved October 18, 2012. ↑ "Jered Weaver first in AL to 20 wins as Angels prevail". ESPN.com. Associated Press. September 28, 2012. Retrieved September 28, 2012. 1 2 "Mike Trout Statistics and History". Baseball-Reference.com. Associated Press. June 3, 2013. Retrieved June 3, 2013. ↑ "Yearly League Leaders & Records for Stolen Bases". Baseball-Reference.com. Retrieved May 17, 2013. ↑ "Robinson Canó Statistics and History". Baseball Reference. Retrieved November 30, 2013. ↑ "Yearly League Leaders & Records for WAR Position Players". Baseball-Reference.com. Retrieved May 16, 2013. ↑ "2012 Los Angeles Angels of Anaheim Batting, Pitching, and Fielding Statistics". Baseball-Reference.com. Associated Press. June 3, 2013. Retrieved June 3, 2013. ↑ Alden Gonzalez (June 7, 2013). "Trout a unanimous selection as AL ROY". MLB.com. Retrieved June 7, 2013. ↑ Mark Newman (May 18, 2013). "Trout adds Heart and Hustle Award to accolades". MLB.com. Retrieved May 18, 2013. ↑ "Heart & Hustle Award". mlbpaa.mlb.com. Retrieved November 27, 2013. ↑ Michael Dub (May 18, 2013). "MLB Awards: Mike Trout Headlines List of Silver Slugger Winners". Bleacher Report. Retrieved May 18, 2013. ↑ "The 2012 Awards". ACTA Sports. October 25, 2012. Archived from the original on October 26, 2012. ↑ Silver, Nate. "The Statistical Case Against Cabrera for M.V.P.". New York Times. Retrieved November 27, 2013. ↑ Schoenfield, David. "Cabrera wins on narrative, not numbers". New York Times. Retrieved November 27, 2013. 1 2 Caple, Jim. "AL MVP: Way too close to call!". ESPN.com. Retrieved November 27, 2013. 1 2 Stark, Jayson. "Time for year-end awards". ESPN.com. Retrieved November 27, 2013. ↑ Zinser, Lynn. "M.V.P. Voters Trust Their Eyes". New York Times. Retrieved November 27, 2013. ↑ Miller, Scott. "Voters knock it out of park by correctly choosing Miguel Cabrera as MVP". CBS Sports. Retrieved November 28, 2013. ↑ Gonzalez, Alden (September 30, 2012). "Hunter stuns Rangers in ninth inning of Game 1". Major League Baseball Advanced Media. Retrieved October 1, 2012. 1 2 Miller, Scott. "Numbers point to center, but Angels will move Mike Trout back to left". CBS Sports. Retrieved November 28, 2013. 1 2 3 4 5 6 "Mike Trout 2013 Batting Splits". Baseball Reference. Retrieved November 28, 2013. ↑ "Mike Trout's first career slam helps Angels rout Tigers". ESPN.com. Associated Press. June 3, 2013. Retrieved June 3, 2013. ↑ Gleeman, Aaron. "Angels place Peter Bourjos on DL, will activate Erick Aybar". hardballtalk.nbcsports.com. Retrieved November 28, 2013. ↑ Eric Goldstein (June 11, 2013). "Millville graduate Mike Trout has rebounded from sluggish start with Angels". South Jersey Times. NJ.com. Retrieved June 11, 2013. ↑ "ESPN: Mike Trout hits for cycle, collects 5 RBIs as Angels drub Mariners". ESPN.com. May 21, 2013. ↑ Alden Gonzalez (June 7, 2013). "Scioscia defends decision to return Trout to left". MLB.com. MLB.com. Retrieved June 7, 2013. ↑ D.J. Short (June 8, 2013). "Angels move Mike Trout back into the leadoff spot, bat Josh Hamilton second". NBCSports.com. Associated Press. Retrieved June 8, 2013. ↑ "Mark Trumbo, Angels knock off Red Sox in opener". ESPN.com. Associated Press. June 9, 2013. Retrieved June 9, 2013. ↑ "Mike Trout to move to left as Peter Bourjos is activated". USA Today. Associated Press. June 11, 2013. Retrieved June 11, 2013. ↑ "Hamilton goes deep as Angels rout Mariners". MLB.com. October 2, 2012. Retrieved May 18, 2013. ↑ "Trout leads fresh crop of shining All-Stars". MLB.com. July 18, 2013. Retrieved July 18, 2013. ↑ "Daily Mike Trout update: Reaches base 3 times, scores twice in Angels' 7-3 win over Blue Jays". The Press of Atlantic City. Retrieved July 18, 2013. 1 2 "2013 Major League Baseball Batting Leaders". baseball-reference.com. Retrieved November 28, 2013. ↑ "Miguel Cabrera Goes Back-to-Back". bbwaa.com. Retrieved November 28, 2013. ↑ "Hooked: Mike Trout, Angels settle on one-year, $1 million contract". Sporting News. Associated Press. Retrieved February 27, 2014. ↑ "Mike Trout hit his first career walk-off home run and the celebration was spectacular". For The Win. Retrieved April 6, 2015. ↑ Blum, Ronald (July 16, 2014). "Mike Trout Named All-Star Game MVP As AL Tops NL 5-3". The Huffington Post. Retrieved July 17, 2014. ↑ Axisa, Mike (July 15, 2014). "Mike Trout named 2014 All-Star Game MVP". CBS Sports. Retrieved July 17, 2014. ↑ "2014 Top Home Runs, True Distance – Full List". ESPN Home Run Tracker Online. Retrieved January 22, 2014. ↑ "Trout's monster home run". MLB.com Video. Retrieved January 22, 2015. 1 2 González, Alden (November 14, 2014). "No doubt as Trout unanimous AL MVP Award winner: Outfielder, 23, is first Angel to take home honor since Vlad in 2004". MLB.com. Retrieved November 29, 2015. 1 2 Gonzalez, Alden (April 18, 2015). "Trout goes deep; youngest to 100 HRs, 100 SBs". MLB.com. Retrieved April 18, 2015. ↑ Gonzalezwork=MLB.com, Alden (July 14, 2015). "Trout fourth to lead off All-Star Game with HR: Reigning AL MVP hits opposite-field blast off Greinke". Retrieved July 14, 2015. ↑ Austin, William; Laymance, Boor (July 14, 2015). "MVP Trout fuels AL's third straight ASG win". MLB.com. Retrieved July 15, 2015. ↑ "Mike Trout hits 40th home run of the season". Major League Baseball. ↑ "MLB Wins Above Replacement – 2015". ESPN. ↑ "Angels' Mike Trout wins fourth Silver Slugger". Major League Baseball. 1 2 Berry, Adam (July 16, 2015). "ESPYs honor Jeter, Trout for greatness". MLB.com. Retrieved November 26, 2015. ↑ "Josh Donaldson beats out Mike Trout for 2015 American League MVP Award". HardballTalk. ↑ McGuire, Justin (June 22, 2016). "Mike Trout edges Bryce Harper as MLB's best player in SN50 poll". Sporting News. Retrieved June 23, 2016. ↑ Thurm, Wendy (August 12, 2016). "Mike Trout's numbers prove he's already great and is headed for place among greatest". Sporting News. Retrieved August 14, 2016. 1 2 "Mike Trout wins American League MVP Award". MLB.com. ↑ Lee, Allyssa (November 17, 2016). "Trout joins Bonds as only man with five straight top two MVP finishes". Fox Sports. Retrieved November 18, 2016. 1 2 Footer, Alyson (November 18, 2016). "Grand finale: MLB Awards put cap on season: Trout is Best Major Leaguer; Indians, Cubs win big". MLB.com. Retrieved November 19, 2016. ↑ Rosecrans, C. (July 17, 2012). "Al Kaline calls Mike Trout 'an outstanding player,' compares him to Mickey Mantle". cbssports.com. Retrieved January 22, 2015. ↑ "How do you pitch to Trout/Hosmer?". espn.go.com. October 2, 2014. Retrieved January 22, 2015. ↑ "Mike Trout: "Low-ball specialist"". espn.go.com. July 26, 2012. Retrieved January 22, 2015. ↑ "Mike Trout – Advanced Fielding statistics". Fangraphs.com. Retrieved January 22, 2015. ↑ "Mike Trout – Standard statistics". Fangraphs.com. Retrieved January 22, 2015. ↑ "Qualified MLB Batters 2012–2015, sorted by park-adjusted wRAA (also called Batting Runs Above Average)". Fangraphs.com. Retrieved December 2, 2015. ↑ Verducci, Tom. "Mike Trout is the game's best young player since Ted Williams". si.com. ↑ "MLB Fan Cave Article: Top Five Outfield Catches Of 2012". Archived from the original on October 29, 2013. Retrieved September 29, 2012. ↑ Schneider, Howard. "Book Review: 'Virtual Unreality' by Charles Seife". News Corp. Wall Street Journal. Retrieved July 8, 2014. ↑ "Los Angeles Angels centerfielder Mike Trout is a phenom, but will it last?". ESPN The Magazine. September 20, 2012. Retrieved July 4, 2014. ↑ Gavin, Mike (July 13, 2012). "Phenom Trout brings his talents to Yankee Stadium". Newsday. New York. Retrieved July 14, 2012. ↑ Townsend, Mark (February 8, 2014). "President Obama compares farm bill to Mike Trout during visit to Michigan". Yahoo! Sports. Retrieved September 25, 2014. ↑ Karcher, Andrew (February 6, 2013). "Who is Mike Trout?". Halosdaily.com. ↑ Rovell, Darren (September 20, 2012). "Mike Trout signs first big endorsement deal". ESPN.com. Retrieved November 21, 2013. ↑ Friedman, Josh (February 1, 2013). "Trout stars in Super Bowl ad". The Daily Journal. Retrieved February 4, 2015. ↑ Woods, Don E. (March 21, 2015). "Mike Trout to be face of pit bull spay and neuter campaign". NJ.com. Retrieved July 15, 2015. ↑ Venegas, Natalie. "Mike Trout shoe deal makes history". FOX Sports. Retrieved 2016-04-04. ↑ ". Nike.com". store.nike.com. Retrieved 2016-04-04. Wikimedia Commons has media related to Mike Trout.